In 1976, as a relatively new bride, my mother (Veronica) signed up for a series of cooking classes run by a local cookware store near my parents' house in Connecticut. Up until that point, she'd taught herself pretty much everything she knew about cooking, by experimenting with recipes from her subscription to Gourmet and various cookbooks. But she had never really learned the basics. So, off she went for 3 hours every Wednesday afternoon, to master soups, baking and -- most importantly -- the art of the Cold Buffet. My mother felt much more confident after these classes, and she's been a great cook ever since. As she put it, the classes "opened the door" to a whole new world of improvisation in the kitchen. One of the dishes she learned in the Cold Buffet class in particular stuck with her: a coeur a la creme with strawberries, which she made frequently for Easter while I was growing up. Several years ago, she gave me the recipe, and I now make it regularly. This year, my mother made a coeur a la creme and brought it when she and my father came to our apartment for Easter dinner. We sat around the table, filling our spoons with drifts of the snowy white, barely sweet dessert, and life was good. 1. Line a 6-cup mold or 6 to 8 smaller molds with holes in the bottom (you can buy a special, heart-shaped coeur a la creme molds if you're into that sort of thing -- which I am, as you can see from the photo above), a basket or a colander with a double layer of damp cheesecloth, making sure you cut the cheesecloth large enough that it hangs over the edges of the mold. 2. Put the ricotta and cream cheese in the bowl of a standing mixer fitted with a paddle attachment and mix, scraping down the bowl a few times, until there are no longer any lumps. Add the sugar and vanilla and pulse until combined. Transfer to a large bowl. 3. In a separate bowl, beat the cream until stiff peaks form. Fold the cream into the cheese. In another bowl, beat the egg whites until stiff. Gently fold the egg whites into the cheese mixture. Spoon the mixture into the mold, smoothing the top gently. Fold the cheesecloth over the top to cover completely. Set the mold on a tray and refrigerate for 24 to 36 hours. 4. An hour or two before you are ready for dessert, hull and quarter the strawberries and put them in a bowl with a tablespoon or two of sugar (the amount will depend on how sweet your strawberries are). Cover and let the berries macerate until ready to serve. 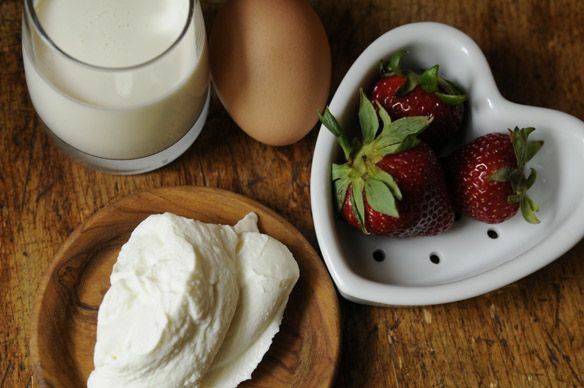 Unmold the coeur a la creme and serve with the strawberries. One of my friends once showed me how to make a cream cheese mousse that is similar (no egg whites and not molded) that is completely addictive. Can't wait to try this version! The ingredients in your couer sound like a delicious combination. I made it once many years ago...but I think that the recipe I used was just yoghurt drained to make a heart shaped yoghurt cheese with strawberries...and sacre couer!!! I don't even like yoghurt!! I love the versatility of this recipe -- you can make it with pretty much any combination of soft cheeses or yogurt. Even cottage cheese works. Thanks, everyone! Let me know if you try it -- it couldn't be easier to make, and because of the egg whites and whipped cream, it's not too heavy. This looks lovely. What a great Mother's day brunch idea! We make this a lot at my cooking school-it's a swap out recipe, and then I have the "problem" of extra desserts for the next few days. My neighbors love me! This may be a dumb question, but what's a "swap out recipe?" I had coeur a la creme about 30 years ago, have never forgotten it, but somehow never thought to make it myself. Now I really must. Thank you Merrill, and Veronica, for this beautiful recipe. Sounds divine. Better than Wimbledon!